So, I have to get a wisdom tooth pulled tomorrow. I'm a little nervous. If by a little nervous I mean, a lot scared. Google-ing is not helping. Seriously, if you have an ailment or health concern, online research can help but I find, more often than not, it scares the crap out of me. 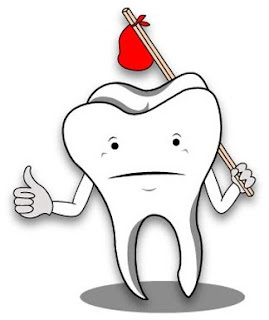 I've never had a tooth extracted before and according to good old Dr. Google, it can take a week to feel normal again. That your face swells up and that's normal. Pain after the novocaine wears off can make it so you can't open your mouth properly. But it has to go. I'm not crazy about the dentist's office in general anyway, but you do what you have to do. It's uncomfortable and awkward to lie there with your mouth wide open and the guy's all up in your face, literally. That bright light in your eyes and the annoying spit sucking device, ugh. All this comes with the territory if you want to have oral care but the thought of a needle in my gums then having a big tooth from the back of my mouth pulled out by brute force, is frightening, to say the least. I hope I'm just over reacting, that it's not as bad as I'm making it out to be. I mean, I've given birth, 4 times, with no medication. This shouldn't phase me. At least then I got a prize, here' all I'm getting is a sore jaw, pain and a mouthful of gauze. Any words of advice? Have you had it done? How was it? Make duaa for me?! I just posted a comment but i think it got lost! Oh well, i'll tell u my experience with having all four out at the same time. First, have you considered ping? It wasn't available when i got mine out ('97) but i highly recommend it! Here's how it went for me: They put a gel on your gums to numb the point where they're gonna inject the needle...it helps a bit, but i still felt it...maybe because i got poked so many times (4 teeth = whole mouth needs numbing) but with one u should only be poked like once or twice. I didn't feel any pain during the extraction, just the pressure from the pulling. There is pain afterwards of course, but it's manageable with percocet (sp?) u just have to take it on time and don't fool urself into thinking "oh i'm okay"...trust me, just take it no matter how u feel at the time. And yes u will look like a chipmunk with a mouthful of nuts for about a week, lol :-)) but then again that was how i looked with 4 out so maybe with 1 out it will be less extreme. Don't worry it's not as dreadful as u imagine. May Allaah make it go easy and fast with minimal pain, ameen. Let us know how it goes! I had two pulled out and it was not too bad at all. They were kind of deformed and not as well anchored as normal teeth should be which made it much easier for them and also less painful for me to recuperate from. My husband had his taken out (two as well I think) and he had trouble tolerating the pain the first 2 days... Really different experience than I had. I think his painkillers were not strong enough for him since he's a heavy dude! Asiya, thank you, yes, I'm going to have the "bing" shot I guess that's the same as novocaine? Something that numbs it anyway. I'll take your advice on the pain killers. No problem there! I'll post how it goes, inshaAllah. Ameen, thank you. Candice, mine is kinda going to one side for some reason so I hope that makes it easier somehow, I don't know. I guess it's different for everyone. Thanks for your input! Skye, Salam,thanks yea I'm dreading the needle but it helps to know it's what will make me not feel the pull!Thank you sweetie. Like you, i'm not too fond of the dentist in general, so the thought of them pulling a tooth out was more than horrifying for me. What made things worse, my brother got 4 teeth extracted a few weeks before i went in to get my wisdom tooth out and watching him recover was traumatizing considering he stayed in bed for a good part of a week. The initial fear wore off when a senior dentist took over from the student who was treating me. Surprisingly, there was no pain, and the area healed pretty well pretty quickly too. Insha'Allah your experience won't be as scary as mine, and iA you'll recover sooner than expected! -Amina, I'm glad it went ok for you and hope to say the same in my next post, inshaAllah. Asiya, Oh, I didn't think of that. I've never had general anesthesia but I'm pretty sure I'm just getting the numbing kind. Going in a little bit, thanks! I just had one pulled out last week! I guess its better I don't discuss my experience lest I scare you. All I can say is eating ice-cream(yum! ), cold stuff, juices and cold beverages will definitely make you feel better. If need be you can use an ice-pack too. Avoid spicy and hot stuff!! All the best! It will be fine Inshallah:) Do let us know how it goes. Ouch, this sounds painful. Hope everything went well for you today! Enjoy that ice cream! My Little World, I think we all were, ;) Just kidding. HijabiMommy, Thanks, yea it was postponed till tomorrow because the power was out! Typical Egypt, but alhamdulillah.